Attention all 10th and 12th class students, are you looking for information for PSEB Circulars? Here we come up with solution of one place which can give you detailed information at first. 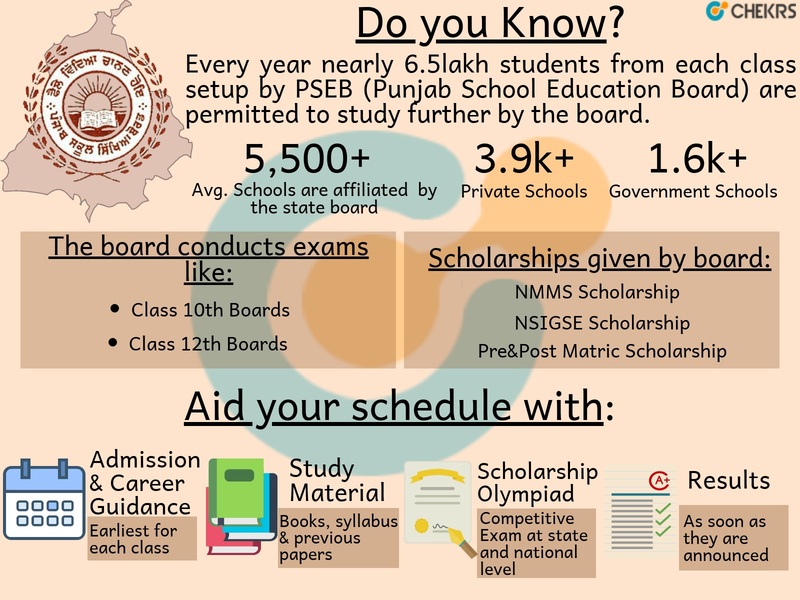 Know Your Board: The Punjab School Education Board was found in 1969 under legislative act of Punjab Government. Based in Chandigarh since then it has been administrating activities for scholarships, publishing books, conducting examination along with other curricular activities. It is not easy for every student to extract information regarding the exam events earliest from the school department. If not so whatsoever be the reason, each\ and every student who want to stay ahead for board examinations. Landing on Chekrs gives every student access to PSEB Date Sheet 10th 12th class so that you can manage to spare time for other tests in the routine. Also, we give you PSEB Syllabus and PSEB Books in pdf so that it is easy to manage studies on the go anytime by using free resources. At last but not the least we also strive to give you all free PSEB Previous Year Question Papers 10th 12th class for preparing and giving your best. For all those students who face difficulties to pursue their education, scholarships are one of the best medium. Here we put our resources to collect information and give you Punjab Scholarship Portal form where best schemes can be known. Also, Olympiads can be known to the students who have been looking to add valuable certificates in their portfolio. At Chekrs you get details such as schemes available for you as per your eligibility and how to apply for them. Why Chekrs for PSEB Class 1st To 12th ? When it comes to take decision for higher studies most of the students disguise it with marks. The right selection shall be done on basis of interest rather than marks. Thus, here as your education partner we give you career guidance to choose right stream. Both the 10th and 12th students can read out extensive information available on which subjects to take, what are courses available for them and what career option it leads to.